Join the Wooden Boat Society of the San Juan Islands for the second annual Yellow Island Wooden Boat Race, to be held Saturday, May 18, 2013, with a start in Deer Harbor on Orcas Island. All wooden sailboats are welcome (boats built of other materials are also welcome but will receive no prizes). The starting line will be south of the Deer Harbor Marina. The marks of the course will consist of various islands and rocks in the area, as well as a race buoy located near the marina. The race entry fee of $15 per boat (and signed liability waiver) will be collected at the skipper’s meeting, held at 9am at the Deer Harbor Boatworks. 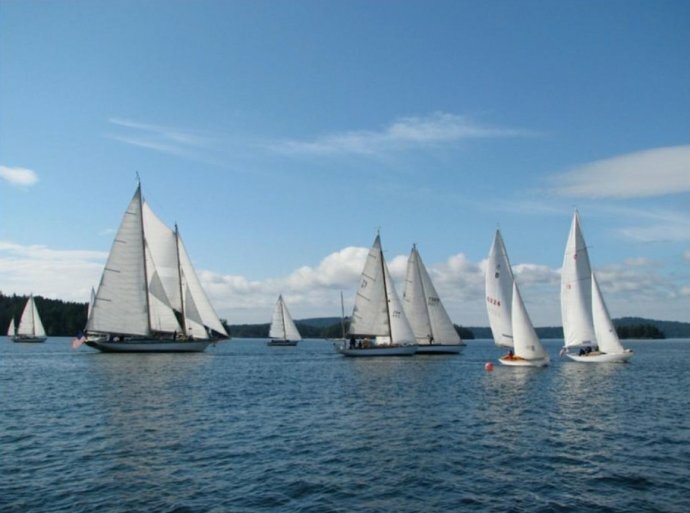 The entry fee includes one continental breakfast; additional breakfasts are available for crew and spectators at $8, provided by the Wooden Boat Society. The race will start around noon, and will have a four-hour time limit. Those without a current PHRF rating will have a temporary rating assigned to them by race organizers. Non-racers are welcome to relax and socialize at the marina. We will try to stage one end of the finish line at the outside float of the marina. Colorful burgees for first, second, and third place finishers will be awarded at a potluck/awards ceremony at the marina the evening after the race. Participant burgees will be available for sale, with proceeds to benefit the San Juan Islands Wooden Boat Society, which seeks to coordinate wooden boat activities in the islands. Discounted moorage for Friday and Saturday nights is available. Call the Deer Harbor Marina, 360-376-3037 to reserve a slip well in advance, as other boat groups are planning to be there. Plenty of good anchorage is also available in the Harbor. Please contact Ward Fay (wardfay@rockisland.com) or 360-298-2057 for more information about the race.